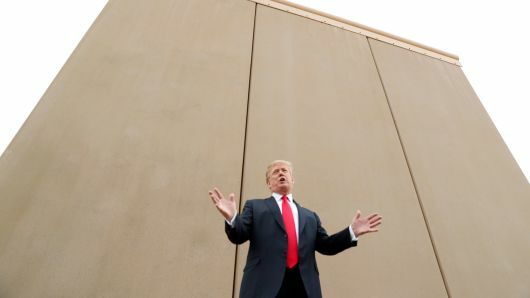 President Trump will give a prime-time address Tuesday from the Oval Office to make his case for closing parts of the government over his demand for $5.7 billion in funding for a wall on the Mexican border. The president also plans to travel to the border on Thursday, a bellicose move reflecting the entrenched positions on both sides of the debate and one that almost certainly means the 18-day shutdown will continue into the weekend. Negotiations had come to a standstill even before the White House announcements about Trump’s address and border visit. Democrats insist it is not possible to have substantive talks about Trump’s demands while parts of the government are shut down. The House this week will begin passing individual appropriations bills for the affected agencies as they seek to build pressure on Trump. Trump’s political operation, for its part, has begun running advertisements on cable television touting his calls for border security and slamming opposition from Democrats. Caught somewhere in the middle are many congressional Republicans, some of whom have shown the strain. Three Senate Republicans have already broken with Trump to call for the government to reopen as Democrats hammer the president and his allies over the shutdown. Vice President Pence plans to visit with House GOP lawmakers Tuesday to prevent defections as Democrats map out votes on reopening the government. Seven Republicans in the House broke ranks and backed a bill opening up parts of the government last week, while five GOP lawmakers supported legislation to reopen the Department of Homeland Security. The Democratic Senatorial Campaign Committee has started to target GOP incumbents with potentially tough races in 2020 over the shutdown, hoping to drive a wedge between them and suburban and middle-of-the-road voters. Sen. Cory Gardner (R-Colo.), who is up for reelection in 2020 and led the Senate GOP’s campaign arm in the last cycle, called for a stopgap measure to end the battle last week. Trump, however, doesn’t appear to be in any rush to get a deal. His high-profile trip to the border signals that he wants at least a few more days to hit Democrats as weak on border security before ending the standoff. “The White House knows the longer they can shine a spotlight on this issue, the better they can make their case,” said GOP strategist Ford O’Connell. Pence and Homeland Security Secretary Kirstjen Nielsen told reporters on Monday that Trump will not budge from his demand for $5.7 billion for a wall and faulted Democrats for refusing to negotiate. “The proposal we put forward yesterday, we think, represents our effort to incorporate their proposals into things that we’re willing to support. But the Democrats have got to start negotiating,” said Pence. Some Republicans say most GOP lawmakers are not feeling the pain yet, even as Democrats exude confidence that they are winning the battle. “Perhaps it’s because of the holidays or something else, but the impact to this point has been extremely muted,” he added. Pence said Trump will use his prime-time address to lay out the case there is a crisis along the border and urge Democrats and Republicans to negotiate an agreement that funds the border wall and reopens the government. Conservative pundit Ann Coulter, whose criticism of Trump is believed to have been a factor in his decision to jettison a Senate bill that would have prevented the shutdown, said Trump needs to make the case for his wall. “We need 1 thing from President Trump: A serious Oval Office speech explaining why a Wall is the only compassionate solution,” she tweeted. But she was dismissive of the border visit. “What will Trump GOING TO THE BORDER accomplish? I’ve been to a hospital. That doesn’t make me a doctor,” she wrote in another tweet. Coulter and other immigration hard-liners have warned that Trump will lose credibility if he fails to deliver on his signature issue. “It’s entirely possible that many of his voters come 2020 are going to be disappointed that his big talk didn’t yield the results he wanted. That’s ultimately what the Democrats hope,” said Mark Krikorian, executive director of the Center for Immigration Studies, a right-leaning group that opposes liberalized immigration rules. Besides a few vocal members of the conservative House Freedom Caucus, most Republican lawmakers wanted to avoid the shutdown fight. But few GOP lawmakers want to risk being seen as undermining Trump. “I really think that the American public supports border security,” said Sen. John Hoeven (R-N.D.). GOP lawmakers are questioning what the endgame is for Trump. They say he hasn’t been clear enough in setting expectations and that they were caught by surprise when Trump torpedoed Senate legislation preventing the shutdown that Pence signaled Trump would accept.